Mt. Hart Wilderness Lodge is located off the western half of the Gibb River Road. 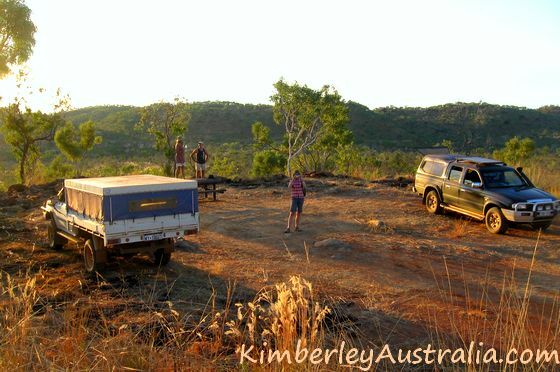 The most scenic part of the Gibb River Road climbs over the King Leopold Ranges, and that's exactly where you find Mount Hart Homestead. The Mt. Hart Station lease covers almost a million acres in the King Leopold Ranges. 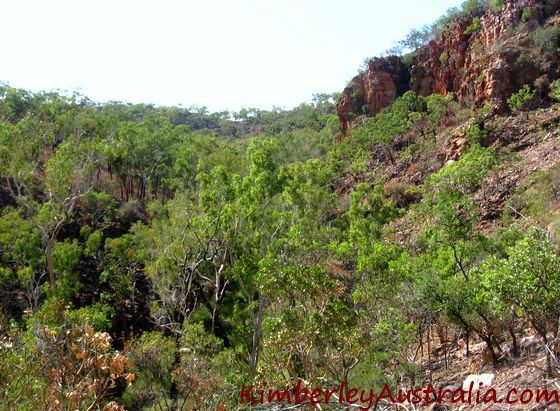 The landscape with its sheltered green valleys and many unusual geological features is very different from the rest of the Gibb River Road. The 50km access track makes for a very scenic drive, winding and climbing through the ranges. This really is a unique and exceptionally beautiful area. It is in fact possible to fly into Mount Hart. No, not internationally. Luckily it's nothing like that! Mt. 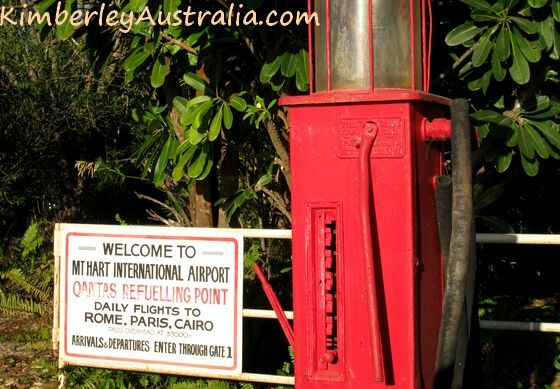 Hart is a wild and natural place, full of character and history, and 100% authentic Kimberley. Having said that, back then Mt. Hart was still managed by Taffy Abbots. A lot has changed since, but more on that below. Initially Mt. Hart Station was taken up as a pastoral lease. Different owners struggled from 1914 to 1987 to make the place work, but nobody succeeded. The area is just too rugged and remote to make cattle viable. Draughts and floods meant the homestead was shifted several times. The heritage homestead that accommodates visitors today was built in 1960. Eventually Mt. Hart was declassified as a viable pastoral lease and finally the area was gazetted as the King Leopold Conservation Park in 2000. Taffy Abbotts managed Mt. Hart (as a joint management venture with the Department of Environment and Conservation, now the Department of Parks and Wildlife) since 1990, and there wasn't much left of the place when he arrived. What you find here today is entirely the result of his dedication and love for the place. Kim arrived at Mt. Hart to stay for one night, and eight years later she was still here, giving Taffy a hand to run the show. Between them they maintained, financed, extended and preserved Mt Hart's history, homesteads and gardens, something that unfortunately the DEC had not really shown much interest in. The story of the establishment of the original homestead, in fact, the whole history of Mt. Hart, is well worth watching: Kim has skillfully put together a 12 minute DVD, hilariously narrated by the unimitable Taffy. You can watch the DVD at the bar at the homestead. It will make you laugh out loud a few times, but more importantly, it will make you look at the place with different eyes. Taffy had estimated the value of the improvements he had undertaken at about A$1.9 million. Being a man of the bush he had done everything in good faith and based on oral agreements only. He had expected to grow old at Mount Hart, a place he dearly loved. That was not to be. In 2010 the Department of Environment and Conservation asked him to leave, just like that, and offered him A$200,000 if he did so within 28 days. Taffy and Kim tried to reason and tried to fight for their home, but being two simple people against the relentless mills of a government department, they got nowhere. Here is the newsletter issue that I sent to my readers during that time. The newsletter elicited a huge avalanche of mails and phone calls to the DEC and to the state government representative, the media took note and made sure the rest of Australia did too. Many influential people got on board to help Taffy and while nobody could prevent him from being forced off the property, at least he managed to negotiate much more time and better financial compensation. 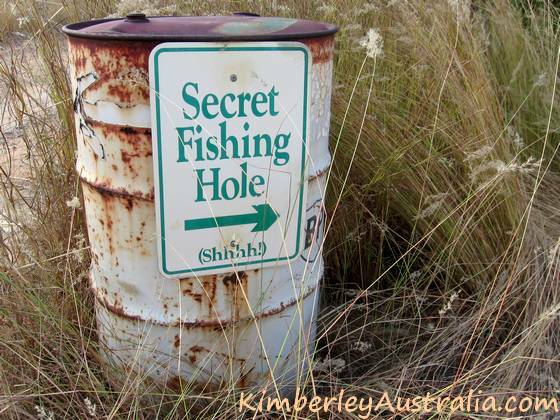 In 2011 Taffy and Kim received an undisclosed amount and left Mount Hart. As expected, the Mount Hart service contract was then awarded to the upmarket tourism operator APT, who operates several luxury wilderness lodges throughout the Kimberley. But APT did not end up converting Mount Hart into another of their wilderness lodges. In fact, they soon tried to get out of their financial obligations altogether, and they never spent any money on the place or did any improvements. 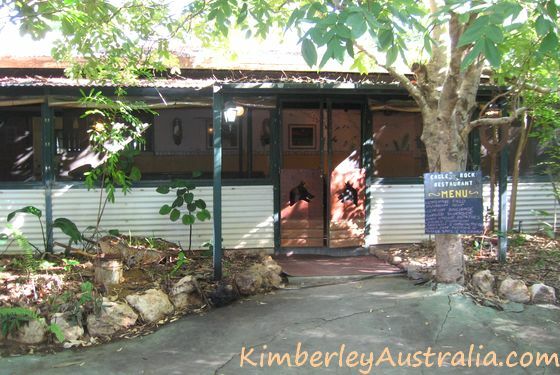 After a period of neglect, Mount Hart was finally taken over by Colin and Mitsie Fitzgerald, who already owned several tourism businesses in Kununurra. They have been looking after Mount Hart and operating the accommodation and campground since 2015. I would say today Mount Hart is a warm and welcoming place again, but it is not what it used to be. Something has been lost forever. Accommodation at Mt. Hart is in two heritage homesteads with shared bathroom facilities. One building is the original homestead (pictured further up the page), and lucky you if you get to stay there. The place really has something. 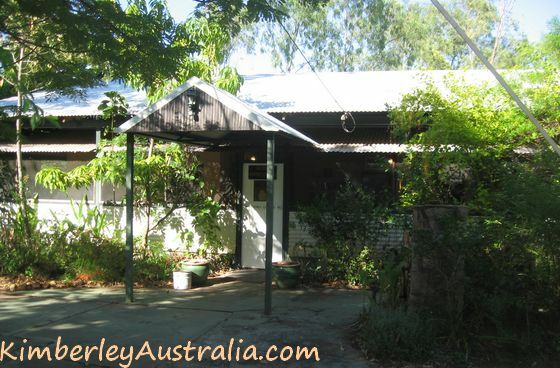 The second homestead was built by Taffy, in the same style as the original one. It looks very similar on the surface, but it doesn't shelter the same memories and spirits of the past. 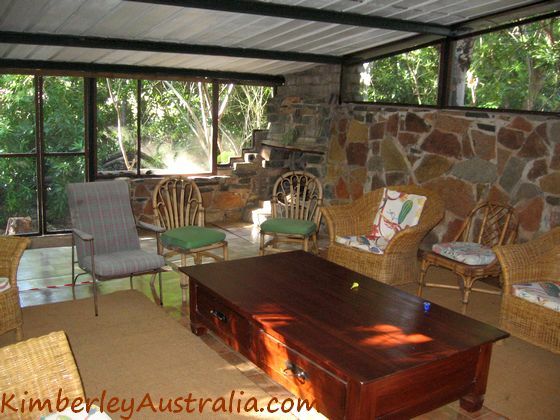 The fly-screened living area with fire place at the original Mount Hart homestead. Alternatively you can stay in the new safari tents with ensuites that were put in by the Fitzgeralds. 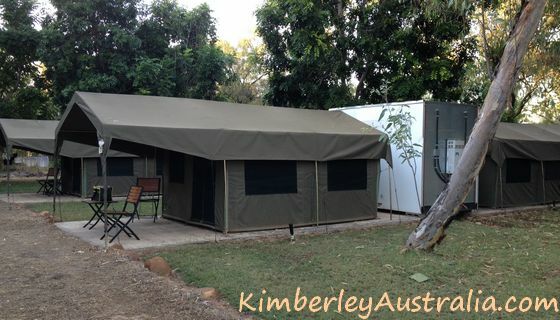 The new safari tents at Mount Hart. Just as charming? © Photo by reader Valerie. 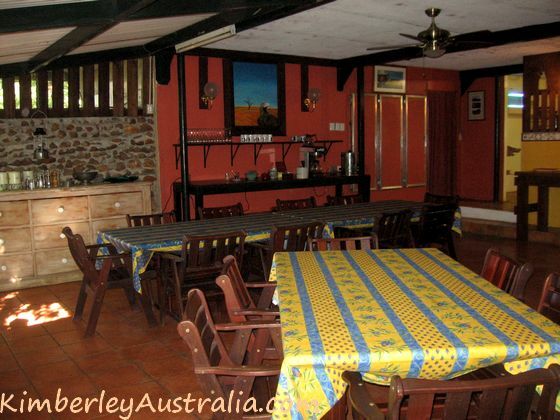 Dinners and breakfasts can be booked at extra cost and are a buffet style, get together affair in the communal dining room, also known as Eagle Rock Restaurant. 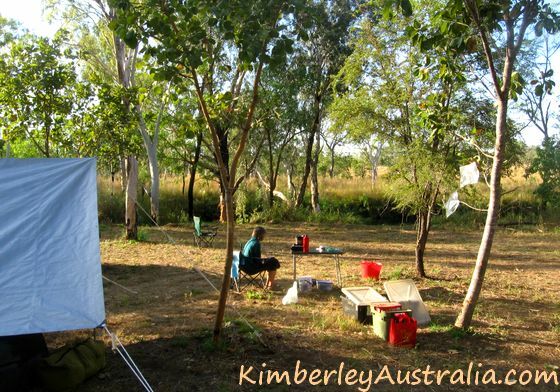 There is also a fabulous campground (Taffy had only built it just before leaving), located on the bank of the Barker River. 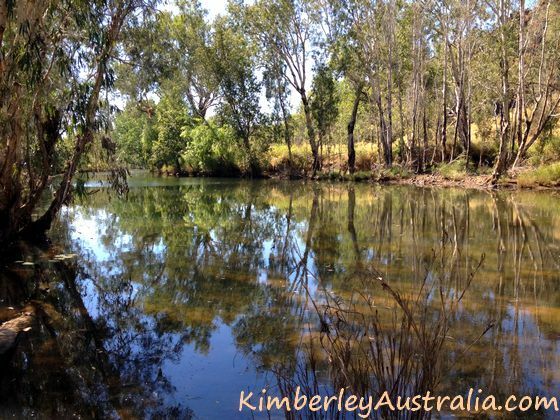 It's a lovely campground, especially right down in the bend of the river, where you can access it for a swim. 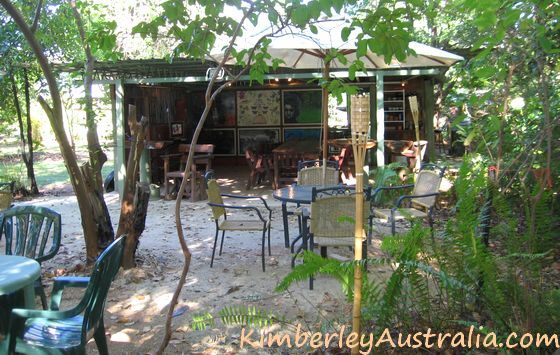 Campers can of course also book into the Eagle Rock Restaurant or join everybody at the Three Dingoes Bar after dinner. Mt. Hart's dingoes are also special. They are pure dingoes that are not kept as pets but come and go as they like. However, they were hand reared by Taffy and used to be very friendly! In the past you certainly met them because they used to hang around the homestead, visit you in the campground and they were also known to sneak into the dining room. That does not happen any more, but they are still more friendly than the average wild dingo and you may see the older ones or the next generation as you are exploring the property. What else is there to do at Mt. Hart? Annie Creek Gorge is a great little wilderness walk, easily extended into a great longer wilderness walk, if you are so inclined. Just follow the creek. Mt. 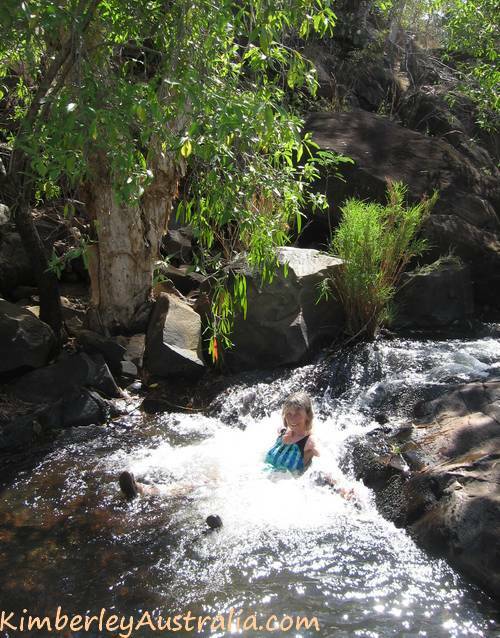 Matthew Gorge also has a delightful creek, meandering through the black rocks and cliffs of the gorge, with dozens of shady, small pools, rapids and waterfalls. 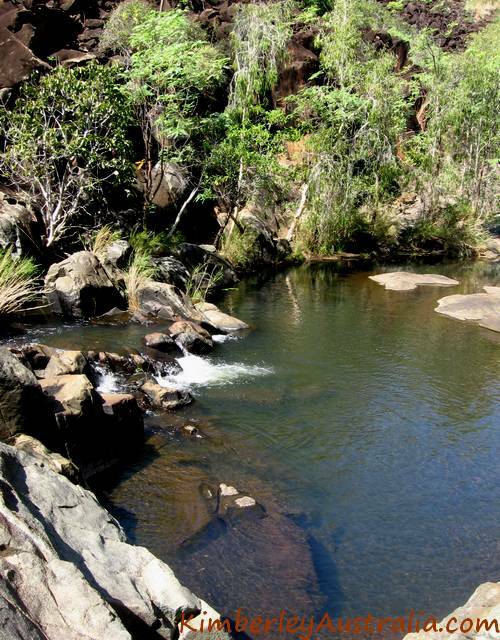 You can follow it as far upstream as you like, though this time the emphasis is on relaxing in the pools, not so much on bushwalking. 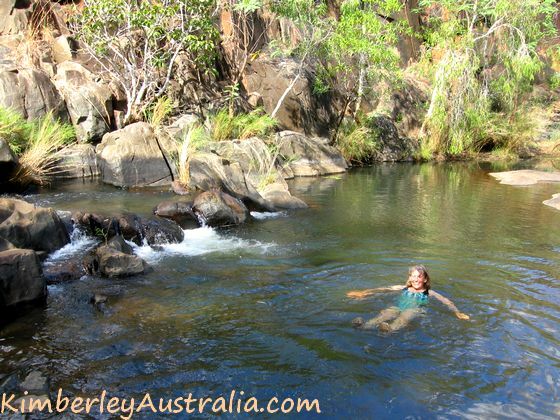 If you want to go for a real swim the best place is Barker Pool, a long and deep section of the Barker River where you can do Olympic length laps if you like. Barker Pool © Photo by reader Valerie. And for sunset there is the Sunset Hill, just across from the homestead. It's a nice little 4WD climb up the hill, in low range, totally blinded by the setting sun and hoping for the best. Mount Hart Wilderness Lodge is unique, totally different from all the other places and gorges along the Gibb River Road. 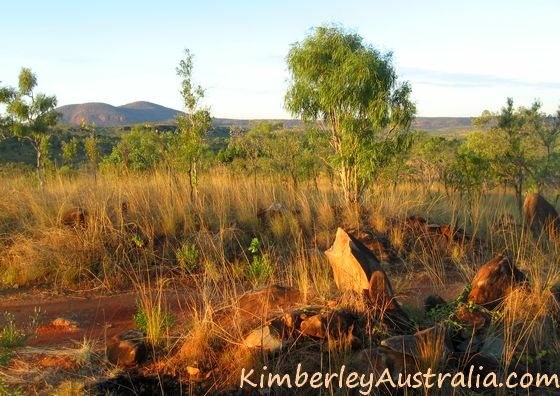 Especially if you come from the Kununurra side and those gorges are starting to all look the same, Mt. Hart is a really nice contrast. 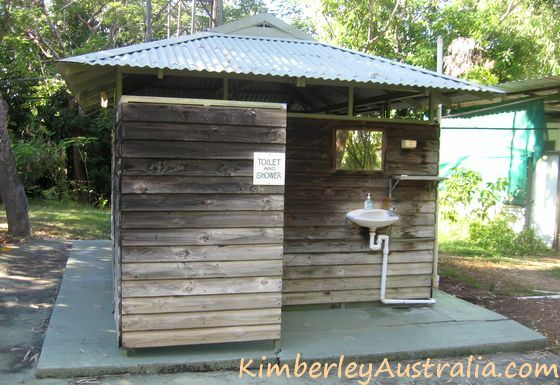 Read about other stations and accommodations along the Gibb River Road.